The Republic F-91 Thunderceptor was an mixed-propulsion interceptor using a jet engine for most flight, and a cluster of four small rocket engines for added thrust during climb and interception. The design was largely obsolete by the time it was completed due to the rapidly increasing performance of contemporary jet engines, and was built to the extent of two prototypes only. One of these was the first US fighter to exceed Mach 1 in level flight. 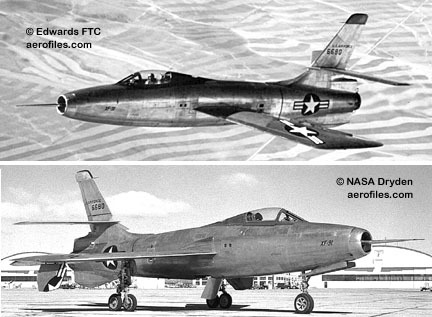 The Thunderceptor design was one of two swept-wing modifications based on the original F-84 Thunderjet, the other being the F-84F Thunderstreak which happened later. A serious problem with most swept wing designs of the era was dangerous performance at low speeds and high angle of attack. At low speeds airflow over the wing tended to "slide" towards the wingtip, which caused it to stall before the rest of the wing. In this situation the lift from the wing would start moving forward, pitching the nose up and leading to an even greater angle of attack. Planes caught in this regime would often stall and crash, and a rash of such accidents on the F-86 Sabre led to the term Sabre dance. The Thunderceptor's most notable design feature was intended to address this problem. The wings were built to have considerably more chord (distance from front to back) at the tip than root, allowing them to generate more lift. This neatly addressed the problems with Sabre dance by delaying the point of stall on the tip to that of the entire wing. A side effect of this design was that the tips had more internal room, so the landing gear was mounted to retract outward with the wheels lying in the wingtips, using two small tires instead of one larger one. Another design change was the ability to vary the angle of incidence of the wing as a whole, tilting it up for low speed operations during takeoff and landing, and then "leveling it off" for high-speed flight and cruise. This allowed the fuselage to remain closer to level while landing, greatly improving visibility. In keeping with it's intended role as an interceptor, the nose was redesigned to incorporate radar, forcing them to move the air intake for the engine from it's original nose-mounted position to a new intake below it. The fuselage was otherwise very similar to the F-84's. The first prototype did not include the radome, although this was a part of the second prototype. The first prototype made its first flight on May 9, 1949, breaking the speed of sound in December 1951. It was later modified with a small radome for gunnery ranging (although not the "full" radome from the second prototype. The second prototype included the full radome and chin-mounted intake, but was otherwise similar. This airframe was later modified to use a V-tail for testing. With both the jet and rockets running, the plane could reach Mach 1.71, rather respectable for the early 1950's. Both prototypes were used for testing for several years. As an interceptor the Thunderceptor was soon eclipsed by designs from other companies, but like the Thunderceptor none of these would go into production. The US Air Force decided to wait the short time needed to introduce newer and much more capable designs created as a part of the 1954 Interceptor project. The Thunderceptor, like the other interceptor designs of the era, had extremely short flight times on the order of 25 minutes, making them almost useless for protecting an area as large as the United States. The 1954 designs outperformed the F-91 in speed, range, loiter time, and included the radar and fire control systems needed for night and all-weather operation. The era of the dedicated day fighter-type interceptor were over. Maximum speed: 1126 mph (Mach 1.71), 984 mph at 47,500 feet.